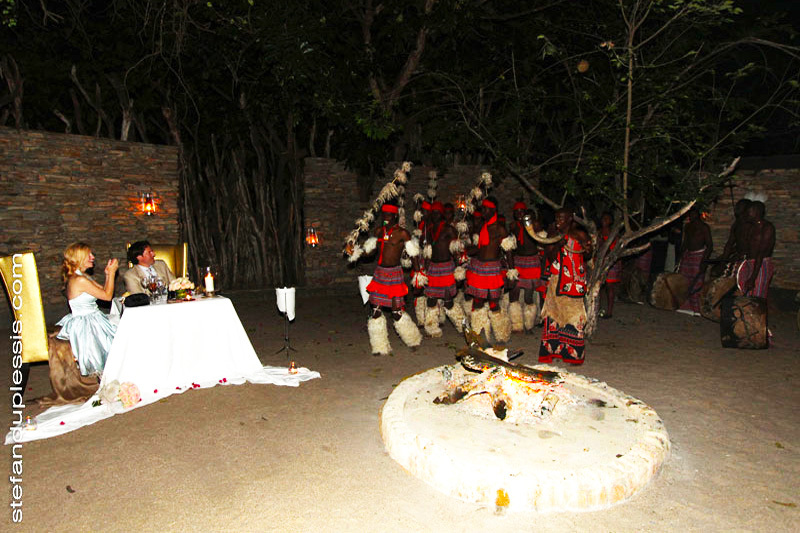 After our ceremony in the wide open bush (see Chitwa Chitwa Part Three for more details) we were taken to a surprise location for a romantic wedding dinner for two. Tucked away in the quaint courtyard of the lodge and centered around a roaring fire-pit, the crew at Chitwa, once again amazed us with a perfectly picturesque setting. 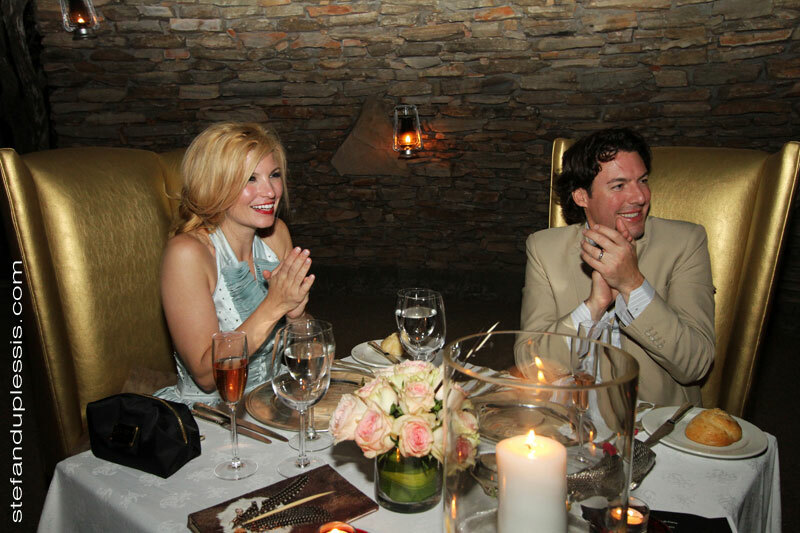 A lovely wedding dinner for two! Within a few minutes of being seated, we began to hear a rumbling of strange noises…drums…unusual calling sounds – and then they appeared! 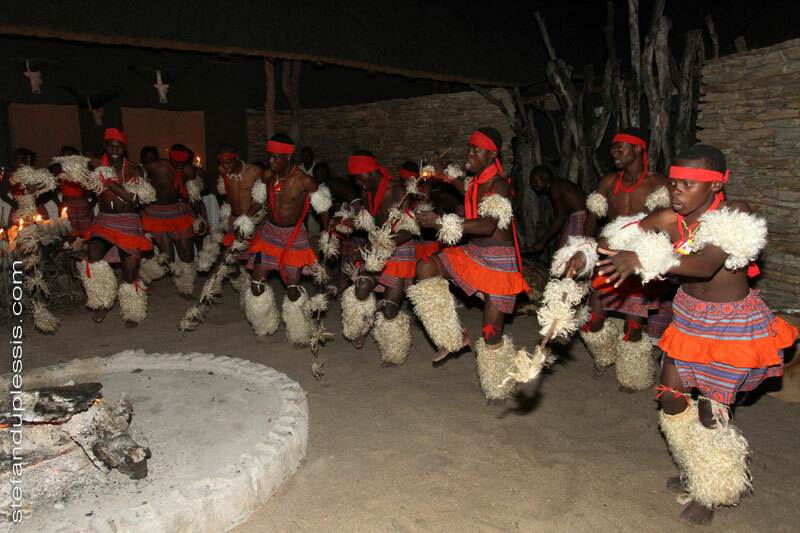 An authentic tribe of African dancers to perform for us! These dancers were no joke. Completely in sync with their moves and their chanting. Incredible! Then…they ask us to join in the fun with a special serenade for us to have yet another first dance (officially our fourth!). Then the party really got started (before dinner of course…I mean why not?). The leader of the group called out to all with a loud party cry! I have never heard anything quite like it. I hope to hear it again some day! 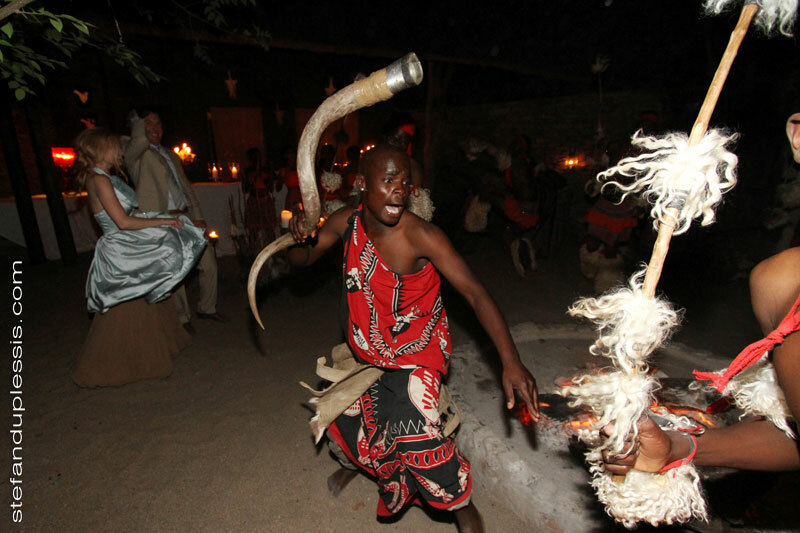 The photograph above was the last picture taken at our African Bush Wedding Celebration…why you might ask? Well…moments later when my feet actually came back down to earth, they were completely twisted and intertwined with my wedding dress – which caused me to lose my balance ,and I fell flat on my back into the FIRE! That’s right…at that very moment I became A Blonde Burnt Bride in the Bush! Luckily, the tribe leader and Brett were able to pull me from the flames in record time. Thank God. Do you know how much aerosol hairspray I use? I would have gone up like a nuclear bomb if my entire head of hair had hit. I did lose a few locks – but the real victims were the dress and my back. “Sorry” to our future daughter (or maybe a, “you’re welcome” is more likely in order) wearing your mother’s wedding dress will not be an option. Thanks to Shannon – Dr. Shannon that is – lodge manager, wedding planner, and burn unit warrior extraordinaire – things turned out much better than they could have. The lodge had all the tools and equipment necessary, and she had the skills to treat my wounds (2nd and 3rd degree burns) just as a hospital would have (which was hours away BTW). Note to self: avoid dancing around fire-pits when miles away from medical care. In fact: avoid dancing around fire-pits all together. Back in our room, the smell of singed skin, scorched silk, and burnt hair (sounds lovely for your honeymoon night right?) filled the air. Shannon was in and out throughout the night checking and/or changing the dressings on my back and arm. Let’s just say – it wasn’t an ideal situation for romance. That and the fact that they gave me some crazy pain killers that knocked me out…. But – it does make for a great story now, right? Frankly, even if this entry has bored the pants off of you, I hope you will at least lie to me. The picture above was taken a few days later when we were finally near a pharmacy on our way to another lodge. 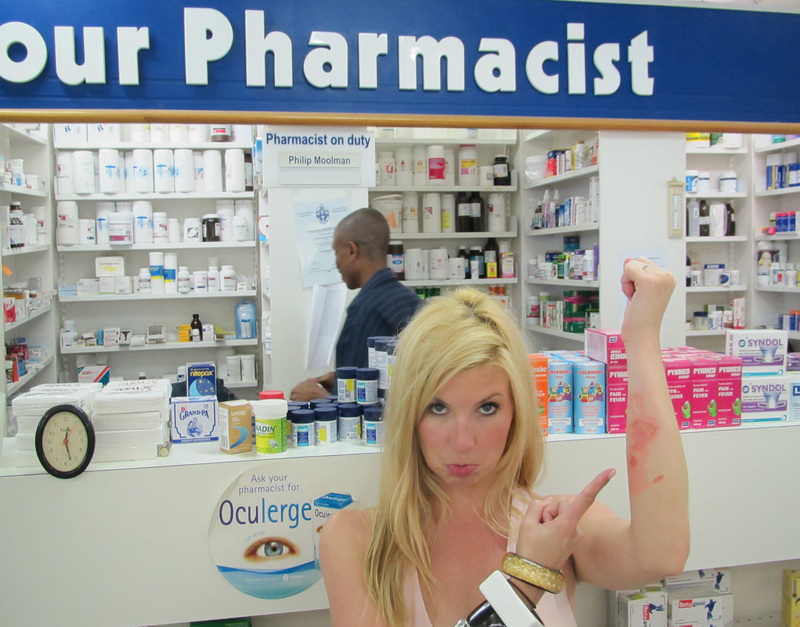 The pharmacist prescribed an antibiotic and Silvadene creme (this stuff works miracles). My arm had nothing on my back…but my back just looked too gross to show the pictures. I would like to report that 3 months later – things are looking much better. I will most likely have permanent scars – but at least Stefan du Plessis got a lot of pictures of me in a backless dress that day. Plus, I know how much worse this could have been. I thank my lucky stars (i.e. God) every day, and I am more than happy to LIVE with scars. And truthfully, the happy memories of that day way outweigh the burnt ones. Images courtesy of Stefan du Plessis – South Africa Photographer. Oh my goodness. I burnt my face in October with steam from the microwave and had 2nd degree burns. Thankfully you found some silvadene…you are right, it does work miracles. Glad to hear you can laugh about it now. NOOOO! I’m so glad you’re okay! Put Emu oil on it as it heals babe and stay out of fires from now on! You looked beautiful though and it looked like such a fun time before you danced in the fire! I get frantic every time I hear about this, annd reading what you wrote scares me even more! Mona and Mark and I and lots more family are so thankful to God that it wasn’t worse! Ugh! I am Chinese. I know my Chinese GFs would cry, so ruined the beautiful memory. Not you!! Thank God, you are ok! Now I have more to tell my friends about your adventural wedding.